The stainless steel injector with high-pressure foam lance, which is installed via a T-piece between the outlet of the high pressure unit and the original spraying unit is especially designed for the professional cleaning of trucks of shipping or food companies as well as for applications in the industrial foam cleaning. 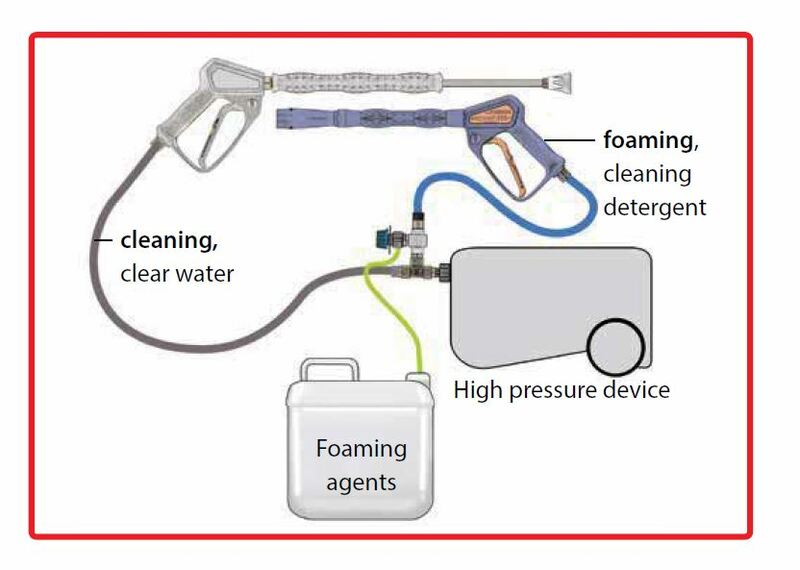 The connection from injector unit to the high-pressure foam lance is realized by an optionally high-pressure hose of up to a length of 40m. The already existing spraying unit is used for cleaning and rinsing works. Enormous savings of both cleaning agent and time can be achieved as the foam lance has cleaning agent immediately available without switching at the unit or change of equipment. It is possible to simplify the handling of the construction and to boost efficiency at the same time by integrating two hose reels. This set is suitable for all common high pressure-cleaning units for up to 310 bar and max. 90°C.